Home » Academics » Schools » School of Science, Engineering and Technology » Faculty » Melissa Karlin, Ph.D.
Melissa Karlin, Ph.D., earned her doctorate from the Infrastructure and Environmental Systems program at the University of North Carolina at Charlotte. Prior to pursuing her Ph.D., she worked as an aviation environmental science compliance specialist for the county government in south Florida and an environmental scientist for a private firm. She also has worked as a grant writer and as an adjunct faculty member, teaching introductory environmental science courses. Karlin studied the spatial ecology of the endangered red wolf (Canis rufus) in her dissertation research, incorporating both Geographical Information System and remote sensing science to study dispersal, interspecific interactions, and habitat use by the red wolf in North Carolina. She has also studied disease transmission in the threatened gopher tortoise (Gopherus polyphemus) in southeastern Florida as well as home range patterns and burrow distribution of this species. At St. Mary’s, Karlin has worked with students on wildlife diversity and abundance research projects and incorporates extensive field work into all her undergraduate students’ research experiences. 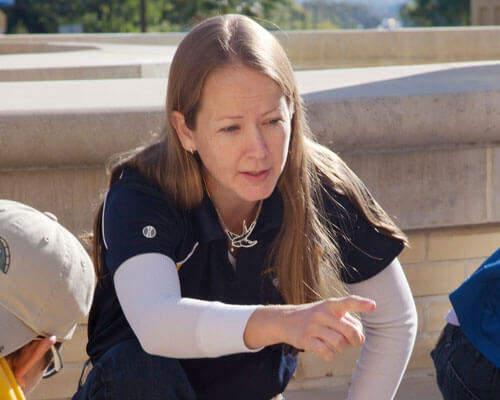 She teaches classes in ecology, wildlife research, GIS and experimental design. Karlin, M., T. Vaclavik, J. Chadwick, and R. Meentemeyer. 2016. Habitat use by adult red wolves, Canis rufus, in an agricultural landscape, North Carolina, USA. Mammal Study 41(2): 87-95. Karlin, M. 2016. Establishment of a baseline wildlife diversity and abundance in a fire-suppressed Edwards Plateau Woodland community, Mountain Home, TX. Presentation, Texas Chapter of the Wildlife Society Annual Conference, San Antonio, TX. Karlin, M. 2015. Using camera trap technology to determine wildlife diversity and abundance at a state natural area. Presentation, Texas Chapter of the Wildlife Society Annual Conference, Corpus Christi, TX. Karlin, M. and G. De La Paz. 2015. Using camera trap technology to improve undergraduate education and citizen-science contributions in wildlife research. Southwestern Naturalist 60(2-3): 171-179. Karlin, M. and J. Chadwick. 2012. Red wolf natal dispersal characteristics: comparing periods of population increase and stability. Journal of Zoology 286(4): 266-276. Karlin, M. November 2011. Modeling habitat suitability of red wolves, coyotes, and red wolf/coyote hybrids on the Albemarle Peninsula, NC. Presentation, 18th Annual Wildlife Society Conference, Waikoloa, Hawaii. Karlin, M. and J. Chadwick. 2011. Measures of space use and association of two unrelated male red wolves in a shared area. Mammal Study 36(3): 147-153. Chadwick, J., B. Fazio and M. Karlin. 2010. Effectiveness of GPS-based telemetry to determine temporal changes in habitat use and home-range sizes of red wolves. Southeastern Naturalist 9(2): 303-316. Karlin, M. 2010. An assessment of spatial and temporal activities of adult male red wolves using GPS telemetry. Presentation, GPSG Annual Graduate Research Fair, University of North Carolina at Charlotte. Karlin, M. and J. Chadwick. 2009. An assessment of spatial and temporal activities of adult male red wolves using GPS telemetry. Poster presentation, Defenders of Wildlife Carnivore Conservation Conference. Denver, CO.
Karlin, M. 2009. Land use and land cover change in the Greater Yellowstone Ecosystem. Presentation, GPSG Annual Graduate Research Fair, University of North Carolina at Charlotte.